Never underestimate the ability of political junkies to trumpet polls no matter how significant they may — or may not — be but the poll at the Southern Republican Leadership Conference will likely be perceived as significant since it likely reflects GOP undercurrents, the impact of appearances by some candidates, a candidate who won even though he didn’t appear – -and it can probably help some candidates raise money. If the primary election for president were held today, for whom would you vote? Please check the box by the candidate of your choice. Gingrich and Sara Pahlin come in first place in another question about second choices. It’s clear from both questions asked in the poll that Newt Gingrich and Sarah Palin seem to be darlings of the same GOP constituency. It’s iffy that both will run for President but it increasingly seems iffier that Gingrich will throw his hat in the ring. The reason: Gingrich seems to be becoming the early 21st century version of Mario Cuomo, agonizing, pondering, deciding — but perhaps destined never to get his hands dirty and enter the national fray. For all of the huge cheers she got, her role as a must see and MUST COVER new and media political star, Palin’s vote tally was less than stellar. Ron Paul still has an extremely loyal following but there has been little sign that he can actually translate proportionately the loyalty of his followers into primary victories. Will it be different this year given the strength of the Tea Party Movement? Unlikely: he still is too much of a GOP…(brace yourself for the word)…maverick for many party regulars in members of the GOP party elite. Republicans and tea party activists are fond of accusing President Barack Obama of being a socialist, but today party gadfly Ron Paul said they had it wrong. The poll is good news for Mitt Romney, who can use some after being at the top of some state polls but still somehow not a candidate who seems to get the party faithful excited. (Remember how in 2008 after being dissed by conservative talk show hosts he became the flavor of the minute once he was seen as a possible candidate who could stop John McCain?). In this case, he didn’t even show up — a fact not lost on many commentators. 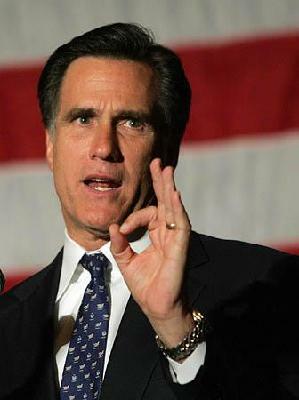 So this means the political class will continue to perceive Romney as a formidable presence. Danger: if he is seen as a “front runner” this soon that probably means his opponents will focus their political fire on him, even if Palin is getting ink and oohs and aahs from adoring pro-Palin new and old media Republican conservative writers. This kind of poll ain’t Gallup or Rasmussen. But it is one that will be noticed — likely touted by the frontrunners in public and dismissed as truly meaningless by those who didn’t get many votes (who would be touting it loudly if they were in first place). Like most polls it’s a snapshot — and of an even smaller area than most polls that are also snapshots. But it means at the very least that the media won’t be ignoring Paul and Romney, even though Gingrich and Palin are much more fun to cover due to their often over-the-top talk show political culture rhetoric which is juicy, taste-bud sparking red meat to the party’s base. The straw poll result extends the rivalry between Romney and Paul supporters at these early GOP events. According to reports on the ground in New Orleans, both candidates had groups at SRLC actively campaigning for votes. In the last straw poll matchup — at CPAC in February — Paul won with 31% of the vote. Romney came in a distant second with 24%. ….The SRLC poll is also notable because, unlike CPAC, it was a test for Sarah Palin. Some Palin supporters chalked up her poor result in the CPAC poll (she got just seven percent of the vote) to the fact that she skipped the annual conservative jamboree. Palin gave a rousing and widely-viewed speech at SRLC on Friday, and came in third in the straw poll with 18% of the vote, just a seven votes ahead of the fourth-place finisher, former House Speaker Newt Gingrich. Mitt Romney didn’t even speak at this Conference — he was on a book tour. Has the Romney machine coopted the Paulian poll spamming technique? Again, our so-called “socialist” president is following in the footsteps of his Republican, “big bidness” predecessors. The economy (based largely upon the Military Industrial Complex economic model our leaders favor) is on the grow according to Business Insider. Well, aside from the military, where are the damned jobs? Oh, that’s right — it takes a “minute” for those to follow a boom, right? President Barack Hussein Obama, the Neocon and the Oligarch (I’m surprised G.O.P.’ers don’t just LOVE this guy? ), is carrying the torch of the Authoritarians well — the American Middle Class has just about been completely eradicated after 9.5 straight years of this brand of politics. The poll, meant to take the pulse of Southern GOP activists, has little meaning, but Romney — who did not even attend the event — will surely use it to tout his credentials. He was even able to defeat Texas Rep. Ron Paul, who won the straw poll at the Conservative Political Action Conference in February and pushed his supporters to attend this event. Tennessee Sen. Bill Frist won the straw poll at the 2006 SRLC in Memphis, where he bused supporters in to boost his vote total. However, Frist did not end up running for president. John McCain, the frontrunner at the time, threw off the credibility of the results that year by encouraging his supporters to vote for George W. Bush. :For Romney, the win basically solidifies the conventional wisdom that he’s the early front-runner for the nomination. Pawlenty, the only other potential candidate who’s actually building an organization, only got 3 percent of the vote here. Gingrich may or may not be running, and as for Palin? Her plans are a mystery, perhaps even to herself. Romney’s team did not view the event as important enough to show up, and Pawlenty sent a video in lieu of making his own appearance. That stands in stark contrast to ’06, when the event attracted every major contender considering a WH’08 bid showed up. That year, Sen. Bill Frist (R-TN) won the straw poll, which was held in his home state; Romney finished second, followed by then-Sen. George Allen (R-VA). Sen. John McCain (R-AZ), the eventual nominee, finished fifth after urging his backers to write in George W. Bush. Romney wasn’t the only candidate to benefit from an organized effort to stuff the ballot box. Paul’s supporters, organized under the umbrella of the Campaign for Liberty, ran an overt campaign to help him both in New Orleans and in DC earlier this year, when he won the Conservative Political Action Conference. SarahPAC, Palin’s political arm, handed out caribou jerky, while supporters carried home-made placards. Mitt Romney won the straw poll at the Southern Republican Leadership conference here Saturday in a victory that will be taken as a sign of the former Massachusetts governor’s strength as a 2012 presidential candidate. That’s because the 2008 GOP presidential hopeful elected to skip the conference to continue his book tour. Still, that Romney would win the poll at an event he didn’t show up for while Palin would come in tied for third place a day after she packed a room full of adoring fans suggests the sort of hyper-engaged activists who show up at such gatherings are practical-minded in their preferences for the next presidential campaign. Even the prospects of Ron Paul becoming a presidential candidate pushes the media to marginalize him. Just looking at the headlines for these two articles suggests bias. The Paul-CPAC win article is titled, “Ron Paul Wins Early Conservative Poll“. The Romney-SRLC win article is titled, “Mitt Romney Wins GOP Presidential Straw Poll“. So Paul’s win was just an early conservative poll, but Romney’s was a GOP Presidential poll? Am I just being a crazy biased Paulite here or are these reports representative of real media bias against Paul? Formerly “nominal Republican frontrunner” Mitt Romney can drop nominal from the title. At a gathering headlined by GOP superstars Sarah Palin, Ron Paul, and Newt Gingrich, it was Romney who took the crown jewel of the Southern Republican Leadership Conference, and he didn’t even bother showing up. He took the victory by single vote over Ron Paul, 439 to 438. Paul had a strong presence of vocal activists at the conference, but it was clear from the voting rank-and-file that his stances of nonintervention and opposition to free-trade agreements were not in line with the party as a whole. Some Ron Paul supporters were not going to take the narrow loss lying down, threatening to sue over unspecified voting irregularities. (Lawyers shouldn’t bother clearing their schedules.) Though Romney was too busy for the conference, his acolytes, Evangelicals for Mitt, worked the crowds this weekend, handing out plastic piggy banks and shaking hands. “I was astonished by how much warmth we felt from people,” says Evangelicals for Romney representative Nancy French. Romney, who also did not attend the conference, benefited from a grassroots effort from Evangelicals for Mitt, a group run by David and Nancy French — who’d helped Romney score a second-place finish at the 2006 SRLC. They’d purchased around 200 tickets, 800 copies of Romney’s book “No Apology,” and 2000 piggy banks with the Evangelicals for Mitt logo. Before the vote, French soft-peddled the meaning of the exercise, stressing that it was “not binding.” After the vote, French held court near the press boxes as his small team hugged and high-fived. Paul’s fans were crushed. “That’s not legit!” one fan yelled when the votes were announced. The small group, waving signs, informed reporters of their worries about vote integrity before heading to a nearby bar for a rally with Paul. The congressman’s 401(c)4, the Campaign for Liberty, snagged around 600 tickets, but had some trouble getting supporters to show up. Palin’s 18 percent, a mild surprise, jibed with an argument made by many SRLC attendees that the former governor of Alaska wasn’t ready for the presidency. Now you can follow Joe Gandelman on Twitter.